The most common species of domesticated hedgehog is the African Pygmy hedgehog, a hybrid of the White-bellied or Four-toed Hedgehog (Atelerix albiventris) and the Algerian Hedgehog (A. algirus). 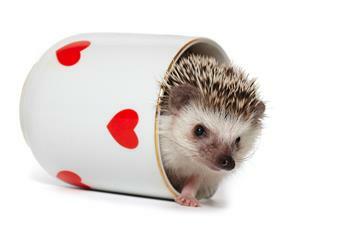 It is smaller than the European Hedgehog, and thus is sometimes called African Pygmy Hedgehog. Other species kept as pets are the Egyptian long-eared hedgehog (Hemiechinus auritus auritus) and the Indian long-eared hedgehog (Hemiechinus collaris). Hedgehog domestication became popular in the early 1980's. They still have much of their wild behavior, including a fear of predators — especially humans, but buying from a responsible breeder and proper handling will do a lot to ensure a friendly relationship. Since domestication began, several new colours of hedgehogs have been created or become common, including albino and pinto hedgehogs. Read more about where to get a hedgehog. Domesticated species prefer a warm climate (above 22 °C , 72 °F) and do not naturally hibernate. Attempts to hibernate due to lowered body temperatures can be fatal, but are easily reversed if caught quickly (within a few days). In the wild they eat a diet of mainly insects, but pet owners generally prefer a diet composed primarily of high-protein, low-fat pellet diet, with regular treats such as mealworms, cooked unseasoned meats, and limited fruits or vegetables. In captivity, we suggest Exotic Nutrition Hedgehog Complete Diet.